Attitudes about the U.S. detention facility at Guantanamo Bay in Cuba have changed dramatically since President Barack Obama took office. Washington (CNN) - Attitudes about the U.S. detention facility at Guantanamo Bay in Cuba have changed dramatically since President Barack Obama took office, according to a new national poll. Support for closing the facility has dropped 12 points over the past 14 months, a CNN/Opinion Research Corporation survey indicates. Shortly before Obama's inauguration, 51 percent of Americans said they thought the facility in Cuba should be closed. 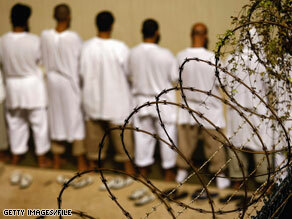 Now that number is down to 39 percent, and six in ten believe the United States should continue to operate Guantanamo. The poll, released Sunday, suggests independent voters are contributing to the 12 point overall drop. "Just Democrats still think that Guantanamo should be closed, but Independents have completely changed - from an even split in January 2009 to three-quarters who want to keep the facility open today," says CNN Polling Director Keating Holland. More than three out of four Republicans questioned in the poll think that the facility should stay open. Upon taking office in January 2009, President Obama said he intended to shut down the controversial detention facility in a year. That deadline has slipped, with no specific date announced for closing Guantanamo. "I believe we're going to get there, but it's complicated," White House senior adviser David Axelrod told CNN's Candy Crowley Sunday on "State of the Union," adding that there has been progress toward closing the facility. Since 2001, the United States has used the facility to detain suspected terrorists from other countries. The CNN/Opinion Research Corporation poll was conducted March 19-21, with 1,030 adult Americans questioned by telephone. The survey's overall sampling error is plus or minus 4.5 percentage points. Since the republicans are so adamant about the cost of everything, my question is how much does it cost to keep this facility open and would it be cheaper someplace else. They only want to talk about expenses when it is to their favor. this place (gitmo) shouldn't even exist. They should be with Allah and all thier virgins. Instead of the MEDIA attempting to UPLIFT us Americans...they continue to focus MORE on pessimistic and negative areas. It's true we need to hear about both sides of an issue or a happening, but why NOT concentrate more on a positive and optimistic result? Too many of us Americans are down in the doldrums due to a plethora of things...unemployment, global warming, the economy, health care, etc.. Try boosting OUR spirits by being a little more hopeful about things. Yes! Keep it realistic...but also, attempt to assist in making things a little better for folks, by offering a glimmer of "HOPE." when reporting the NEWS! Thanks to the GOP scare tactics. Here we go again with the GOP scaring the most uneducatated American people. Fear is all the GOP have. Fear only less for a shot while, It will close just like the passing of the Health Care Reform. Fear is ALL the GOP! 39% regarding Guantanamo.....right on up there with Obama's approval rating. "six in ten believe the United States should continue to operate Guantanamo"
Well, just like health care, evil, elitist, socialist narcisissts and their leader can now close gitmo since it is the opposite of what the majority of Americans want. The chances of Obama doing what Americans want, is the same chance as a Democrat having a thought of his or her own, don't hold your breath. My guess is that most of the people that have changed thier minds on Guantanamo have done so because the Messiah Obama has flip-flopped. These ignorant people can't think for themselves, they need the government to do that for them too. So the American public is now for being Darth Vader instead of Luke skywalker. what a difference a day make. Lets just be the evil empire. lets just go against the creed of the USA. Clearly those people will become undocumented voters if Obama has his way. What silliness! Some 300 terrorists have been tried and convicted in our normal courts and are serving time harmlessly in federal prisons. Somewhere we got confused about the difference between revenge and protecting our own self interest. And most of the people who are so violently objecting to a calmer course call themselves Christians. I wonder what Jesus would actually say about torture? What happened to do unto others, or turn the other cheek? Judge not? Or is that only when it is convenient? THat's not all that people will be disagreeing with. This man is causing a LOT of civil unrest in this country. And he's acting like a communist. This will not be tolerated by the American public. But you got to ask yourself WHY would he do this? Why would our politicians go along with it? What's funny is how people's minds change when things affect them. Once people actually thought about the idea of these terrorists being housed on American soil, their opinions changed. It's just like this health care and the taxes. It's easy to say "tax the other guy". Once again the Fear mongers have had an impact- and once again the tide will be turned back....One step at a time. Does the gop ever try to use brain power to come up with solutions, or are they just stuck on obstruction? The real question isn't about whether it should be closed or not. The real question is about whether it is used as a legal loophole to void the rights of the prisoners who are held there. Operating it is perfectly fine as long as the prisoners there are afforded the same legal rights and protections that they would receive if they were held in an onshore facility and processed in the regular legal system of our country. I won't be voting for that guy again..... you can book that. And this is somehow surprising? Perhaps people are starting to realize that this administrations policies are not leading down the proper path. These figures simply indicate that Republicans are winning the "War of Fear" with the American people. We are holding these people in SuperMax Prisons right now without problems. They have frightened people into not wanting to put KSM on trial in New York. They have people scared to put these terrorist on trial on our own soil. We have laws here that govern us and we should not allow others to use fear to make us do their bidding. The reality verses Hollywood will eventually set in. I imagine opinions have changed since he took office. I'm sure Guantanamo Bay has changed from a war prison to a MUSLIM BOY'S CAMP for the retainees. The great, "who walks on water", is over in Afghanistan right now kissing more hands. Once a snake always a snake. Keep Gitmo open for the Tea Party wing nuts who are terrorizing members of Congress. Guantanamo is located in Cuba, which is a US foe and a friend of Iran. Because of this I wouldn't considered it a "safe place" for holding terrorists. Moreso if there are earthquakes hitting the region.